While the 2.3.0 Beta program is going strong, it has flushed out a handful of bugs in the 2.2 branch and the fixes have been back ported to create this FreePBX 2.2.3 maintenance release. Bugs that were isolated to specific modules have already been back-ported and published. bug 2025 – alert box does not let you edit an extension with a directdid in it. This bug was introduced in FreePBX 2.2.2. And then a handful of other minor changes. ./install_ampWe strive to be extremely responsive to any issues that are encountered when this process is used. 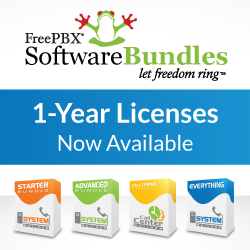 That’s it for now, we’ll keep it short and be back soon with an update on the FreePBX 2.3.0 Beta2 that is about to come out.